Can my business card really make a difference? Yes! Besides demonstrating your company's commitment to the environment, by using the World's Greenest Business Card for your print job - every print run could conserve the resources highlighted in the sidebar to the left (estimated based on our monthly gang press run). Is this really the World's Greenest Business Card? Yes. We've chosen the most environmental FSC-certified stock available manufactured locally in Canada, use vegetable based inks and a waterless printing process to ensure that it is the World's Greenest Business Card. What do I get for $150? What is FSC, and can I get the FSC logo on my business card? The Forest Stewardship Council (FSC) is an international certification system that guarantees that the forest products come from responsibly managed forests and verified recycled sources. You can have the FSC logo on your card. Find out more on the File Specs pagefile specsfile specs. Is it true that you plant a tree for every order? How much is it? What do I get? Our price is $150 for 500 business cards and $200 for 1000 cards. We put multiple card designs on the same press sheet (a shared run) and print 500 of each sheet for economies of scale. Grouping orders on the same run provides better pricing and is a much more sustainable way of printing. I have several different cards for print. Can I get them at smaller quantities? No. Each card is placed on the same press sheet. So there will be 500 cards produced for each different design. Why do you use vegetable-based inks? Vegetable-based inks provide the lowest VOC’s and are the most environmental inks for printing. We also use an overall water-based AQ coating to protect and seal the card. What stock is available? How is it printed? Currently we offer one stock: 14pt uncoated FSC-certified stock with 100% post-consumer waste, made in Canada. We have chosen this stock because it is the most sustainable option available. It is professionally offset (not digitally) printed waterless with low impact vegetable inks. Can I get a die cut on my card? All standard business cards are 3.5 x 2in. You can get a special die cut at an additional cost. Please contact us for a die quote. What colours can I use? 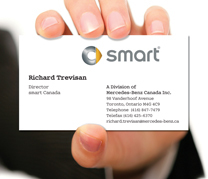 All business cards are printed full colour, both sides CMYK. You can print with PMS inks at an additional cost. Please contact us for a PMS quote. How close will the colours be to what I see on my screen? Your screen is calibrated differently for colour than the printing press. Also, because this is a shared print run we cannot guarantee 100% colour accuracy. Different papers, inks, and printing processes will affect colour. Can I see a proof of my card before it goes to final print? Yes. We will gladly send you a PDF soft proof electronically before the final print run. How often are the press runs? We print sustainable, group print runs every month, or when the demand warrants. If you miss this month's run, the next run will usually be about a month away. If you have any special needs, please contact us and we'll try to accommodate any special requests or timing. We accept PDF X-1a files or Illustrator eps and ai files. Please see our File Specs page for complete instructions to format your files. We can correct files that do not meet these specifications at a rate of $75/hr with a minimum $35 file correction fee. The World's Greenest Business Card is printed once a month. See our printing schedule. It takes about a week from the time we go to press to the delivery of your business cards. What methods of delivery do you provide? We can courier your order to you at an additional charge. Please see the Order Now page for shipping costs. We will be pleased to refund your order up to 72hrs prior to the print deadline. Once your files have gone to print we will unfortunately not be able to offer a refund. However, we will always work to ensure that you are satisfied with your World's Greenest Business Card. *Sources: Savings will differ depending on the type and quantity of paper used. These are representative savings from the Mohawk paper calculator. Environmental impact estimates for savings pertaining to the use of post consumer recycled fiber share the same common reference data as the Environmental Defense Fund paper calculator, which is based on research done by the Paper Task Force, a peer-reviewed study of the lifecycle environmental impacts of paper production and disposal. Values derived are from publicly available information sources. sustainability without having to compromise quality or environmental responsibility, the WGBC fits with the brand principles of smart. is essential to your green messaging. The World’s Greenest Business Card is the most sustainable way to communicate your good green intentions. Offset printed locally using environmentally-friendly manufacturing processes & 100% post-consumer recycled paper made in Canada.